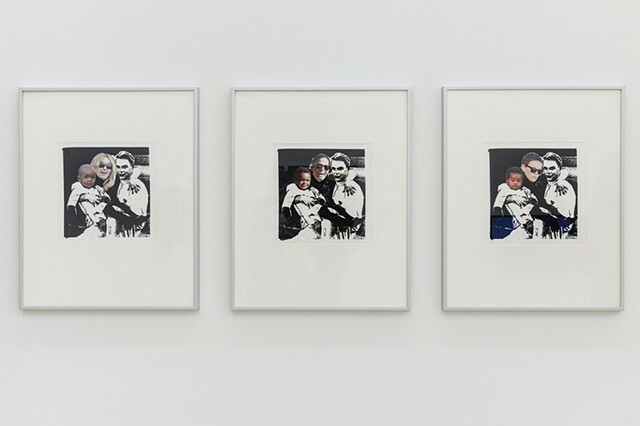 The Tsirk Recast collages are inspired by the 1936 Soviet melodramatic, comedy, musical film Circus (Tsirk). In the film an American circus artist who, after giving birth to a black baby, immediately becomes a victim of racism and is forced to stay in the circus, but finds refuge, love and happiness in the USSR. Friendly Soviet people embrace her black son. The movie climaxes with a lullaby being sung to the baby by representatives of various Soviet ethnicities taking turns. I used a still from the Closing scene of the movie: Marion hugs tight her Russian husband Ivan and son Jimmy, to create the base silkscreen of the images. To recast of the roles of mother (Marion Dixon) and son (Jimmy, Marion's baby) I used images of white American actresses who have adopted black male children. The pictures of the actresses and their children were culled from paparazzi (media circus) photos. Michael Paul Britto graduated with a BA from the City College of New York. Michael's works range from videos to digital photography, sculpture, collage, and performance. Britto has had residencies at the New Museum in New York as well as Smack Mellon, The Marie Walsh Sharpe Foundation and LMCC. Michael has been featured in shows at El Museo del Barrio, The Studio Museum of Harlem, The Zacheta National Gallery in Warsaw, The Kitchen and the Victoria and Albert Museum in England. Britto has been written about in "The New York Times, Art In America and the Brooklyn Rail.